Description: Seeing red! Eastbound CP overhead train on CSX. Description: An old barn and a few silos watch yet another train pass on the CP's Soo Line at Murray Siding. Description: An unknown CP train drifts down the hill with a pair of GEVO's after the sun has surrendered the sky to darkness. I was actually quite surprised I was able to stop this image without a tripod at 125 shutter speed. Description: While I waited for CP 171 at Azelia Ave, I heard a horn behind me. I checked the light and it was a red over a flashing red, and there was a route lined up for the pass track at Humboldt. Minutes later, a train came around the corner, and I then got this shot. Right after I took this, I saw that the engineer was none other then Dean! Description: Mowitch siding first train of a four train meet . 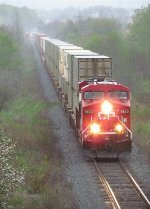 Title: CP 8830, CP's Tomah Sub. Description: NS 6798 & CP 8830 lead NS 318 through Staunton, IL. Description: CP 8830 seen approaching Port Hope from atop the Dickinson Road bridge. Description: CP 641, an empty ethanol train, zig zags through the tight spaces of McGregor. Title: CP 8830, CP's River Sub. Description: CP Train 199, CP-8830-8862. Description: After hearing the latest location for NS 66X, The race is on to get it at CP WOOD.. well..... this is all that I got.